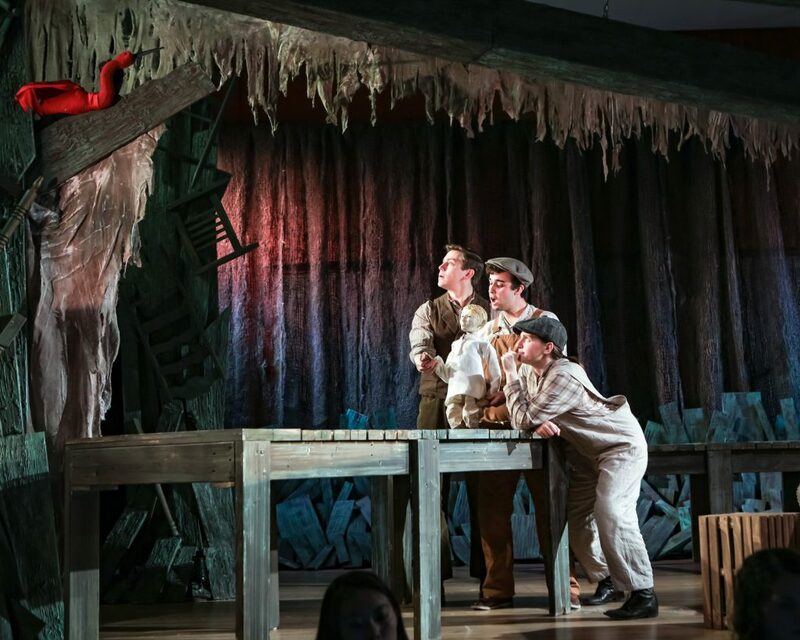 Boston Opera Collaborative opened its new production of The Scarlet Ibis last night at Longy. This opera with a score by Stefan Weisman and a libretto by David Cote, last seen at the PROTOTYPE Festival in New York City in 2015, continues through Sunday with BOC’s two alternating 5-singer casts. Much of the heavy vocal lifting is done by Ann Fogler’s Brother, who carries much of the plot and exposition through dialogue. Fogler rises ably to the challenge, strongly capturing Brother’s overflowing energy in scenes such as an amusing vaudeville routine. Coura’s Doodle, whose light countertenor lines captures both the beauty and fragility of the character, deleivers substantial emotional weight and pathos. Weisman’s score includes several delightful songs, such as the lullaby “Rest, my dear one, rest” (sweetly sung by Britt Brown in Thursday night’s performance) and “Heal me, sweet savior”, which flowers from a solo by Coura into a lyrical and lovely quartet. The concert hall at Longy exacts the expected acoustical tradeoffs. With the 9-piece orchestra placed on the wooden floor in front of the low stage, articulation was indistinct; orchestral dynamics in general ran much louder than desired for my seat in the center-front of the balcony. To follow the English words, balcony seating is ideal because of the ease with which the left/right supertitle screens can be read without turning the head. The narrative of The Scarlet Ibis principally follows Doodle, as the adults slip in and out after the first scenes. Greg Smucker’s stage direction makes an economical use of the stage, which is draped with scenic designer Andy Nice’s swamp and other rustic trappings. Chris Bocchiaro’s lighting design made an effective use of the limited plot, given the lack of proscenium arch or curtain. The opera seems to be conspicuously missing transition music; at the break of each scene, the music drew to an abrupt halt as the cast set about rearranging the stage. A reprise of some of the score’s sweeter tunes would not have been unwelcome. Basil Considine is the Twin Cities Arts Reader‘s Performing Arts Editor and its Senior Classical Music and Drama Critic; he remains an occasional contributor to The Boston Music Intelligencer.